Not everything is broken in Washington DC. Last Friday, Senate leaders released their long-awaited version of the farm bill and there is good news for farmers, hungry people, people of faith and frankly the whole country. 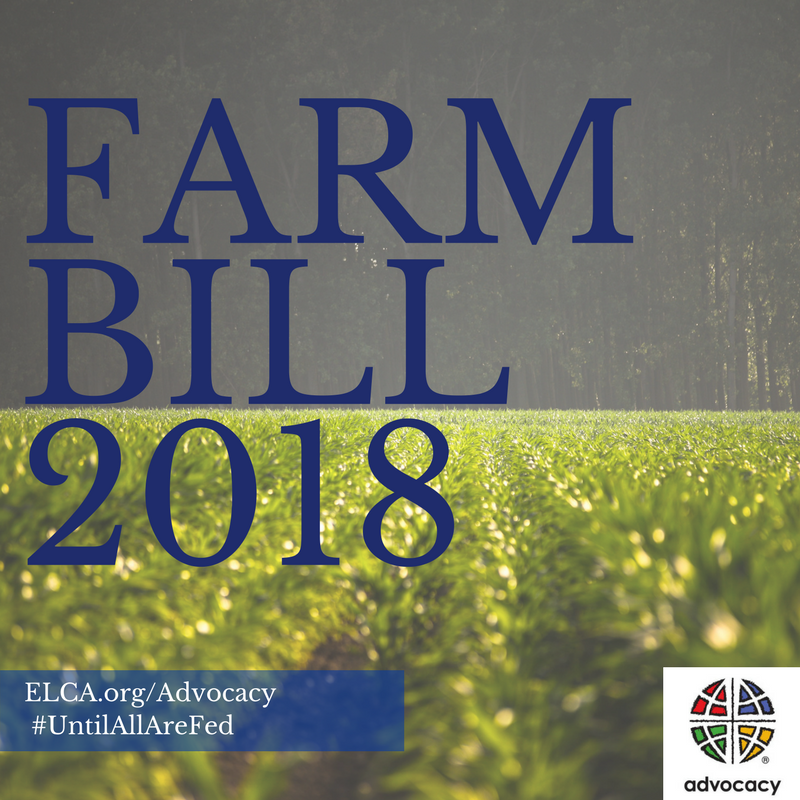 The Senate’s version of the farm bill renewal is a good bill that addresses many ELCA priorities by maintaining strong support for anti-hunger programs. It is a model of how legislation in Washington with bi-partisan leadership ought to move in Congress. Senators Pat Roberts (R-KS) and Debbie Stabenow (D-MI)—the chair and ranking member respectively of the Senate Agriculture Committee—are fulfilling their early commitment to work together on the farm bill. Their press-release statements quote each other positively, a relief in this fiercely partisan climate. A bill that affects every person and every community in the United States and beyond deserves no less. Hunger advocates, farmers, environmentalists, international aid stakeholders, businesses and law makers now begin pouring over the 1000-page bill in preparation for a planned “mark-up” of the bill on June 13. At this time committee members will amend and tweak the legislation before voting to move it to the Senate floor. That’s the easy part. What lies ahead gets complicated very quickly. The House bill passed out of the House Agriculture Committee on a party-line vote with no cooperation between Democrats and Republicans last month. It failed on the floor to get enough support to pass out of the House and was dramatically pulled and tabled. It is expected to return to the House floor around June 22. That bill’s fate is uncertain, and it is unknown now if leaders in the House will be able to muster the votes needed to send it to a conference with the Senate. The Senate draft now puts pressure on the House, but as of this writing, several scenarios exist. Ideally, both chambers should pass their respective bills, meet in conference to iron out differences, vote again on the compromise of the two versions, and send it to the President to sign into law. It all must happen before the current farm bill expires at the end of September. If the School House Rock episode of, “I’m Just A Bill” comes to mind, that’s the way the legislative process is supposed work. The differences in the bill, however, could become a mountain too steep to climb for some members. If managed poorly, ideological gridlock could create a stalemate in both chambers as the deadline looms closer and stakeholders become more impatient. If the deadline is not met, it’s very likely that lawmakers could toss up their hands and let the outcome of the 2018 mid-term elections drive what happens in a lame-duck session after the November 6 elections. This outcome leaves farmers in the lurch and states with more uncertainty that neither can afford. While unlikely, some have floated the idea of a short-term extension, but this also creates uncertainty and chaos. Now Lutherans need to get to work. We need to call our lawmakers at 202-224-3121 with a simple message: work together, do no harm, don’t put farmers and hungry people in peril and do it sooner than later. Our voices will be critical in the coming weeks and they make a difference. Time and again when we lift our voices in the thoughtful ways that Lutherans approach issues like the farm bill, we become a catalyst that lawmakers can’t ignore. It is time do that Gospel work of advocacy now more than ever. Interested advocates can follow the Senate’s hearing on the farm bill on Wednesday, June 13 starting at 9:30 a.m. EST by clicking on this link.